Can you spot the hidden face in this “Coffee Bean Man Illusion“? 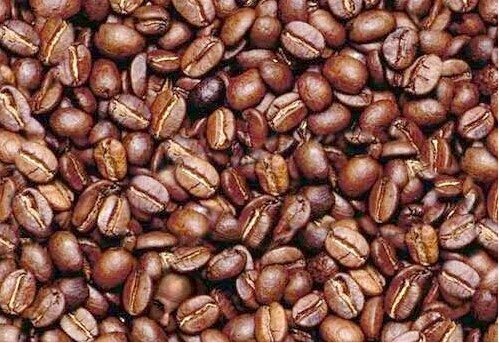 Once you find the face in this coffee beans pile, every next time you look at this picture you will see it immediately! I can’t see the face. where is it? I saw it!!!!! !Clue:It was down there……..HEEHee hee………..
oh now that’s just…… i was staring at that all day!! Not bragging or anything, but I saw the face the second I looked at the picture. I found the face. Who is it? After you’ve found it, it kinda makes you wonder how you couldn’t have found it before, or why other people can’t find it… -,-;… Clue: Bottom left! Doctors have concluded that if you find the man in the coffee beans in 3 seconds, the right half of your brain is better developed than most people. If you find the man between 3 seconds and 1 minute, your right half of the brain is developed normally. If you find the man between 1 minute and 3 minutes, then the right half of your brain is functioning slowly and you need to eat more protein. If you have not found the man after 3 minutes, the advice is to look for more of this type of exercise to make that part of the brain stronger!!! And, yes, the man is really there. Woah, I saw that face like 1 second after I looked at the picture. My right half must be realy good. People, the head is the size of one coffee bean. Don’t try to create a face out of all the beans. Look at each individual bean until you find a real human head instead of a bean. Why nobody could give this hint is beyond me. It shows how many dumb people are out there. i saw it after looking at it bout 4 mins………..vurdalk plz dont make any coments on me…….is that man wearing a skin colored beanie? Haha, how did I not notice that at first. I was looking at all the beans to see if they made a face together. that was cool! I saw it like in 15 seconds! It was pretty awsome! hee hee! it freeked me out too! Where did you get this psycho in the coffe beans from? Is he wanted for murder? I reckon he is. If not then he will be soon. Just look at him. Creep! easy as cake founded in 3 seconds……. I didn’t get it til after i read these peeps clues. ok ok, it took me ages, i thought i saw a reflection of a face in the shiny dark coffee bean near the top! not to brage but i saw it before i even looked!!! I found it after about a few milliseconds. It’s quite fun solving such illusions(is it an illusion??anyway)!!!! WHO’S HEAD IS THE SIZE OF A COFFEE BEAN? HI PLEASE LEAVE MESSAGE ON HOW AND EXACLY WHERE TO FIND IT PLEASE!!!!!!!!!!!!!!!!!!!!!!!!!!!!!!!!!!!!!!!!!!!!!!!!!!!!!!!!!!!!!!!!!!!!!!!!!!!!!!!!!!!!!!!!!!!!!!!!!!!!!!!!!!!!!!!! I was not able to see it until I click on the picture to get the larger image…then it just popped out. gr8 job…liked it very much…all d best…n njoy !!! If you make the image big then you should see it immediately. LOL, after I found the face, I always saw it at first sight. It still happened after I opened the picture again :D Great illusion! who owns this blog? good job! Hint: botton left, and it’s the size of one of the beans, and hes lookin’ up. thats wierd its down at the bottom of the picture thats still realy wierd (big forehead)and once you find it it’s hard not to look at it wierd!!!!!!!!!!!!!!!!!!!!!!!!!!!!!! took me a while to get it, I only got it after reading a hint in a post. Ok. That was wierd. IT TOOK ME LIKE 6 FREAKIN MINUTES TO FIND THE STUPID THING!!! What the hells wrong with me?! WOW. that was so cool. I was looking for it and it was driving me srazy cause I couldnt find it. But then I enlarged it and seen it. Hahaha I found it!!! Very cool pic!!! well very witty did you need to roast a cow in order to make that? I look at the picture about two minutes and saw nothing. After a while I look at it and in the moment I look I saw it. omg that scared the poops out of me!!!!!!!!!!! how does his head get there??? did he poke his head there or what??? Gah, I took me about 2 seconds to find it once I realised I was supposed to be looking for a single face amongst the beans and not one made out of beans. That is my son in the coffee beans!! Where and how did you do that? I had to get my brother to help me find it. It scared me when I found it. U got me that m.r,That was a trick one!!!!!.grrrrrrrr! seen it in no time – is there a bum in there too?? That should be in the Scary Illusion section. I jumped when I saw it… Freaky! ahh, that was a hard one! Well, I found 7 faces and 1 body with legs :-D Not kidding, really. The one near the bootom is the largest one and the others are between the beans. the face is one of the beans! i found it in under 3!! it was hard for a second but i look at the comments so they gave it away. It a real human head! cool! before i looked for it, i read the clues peeps left. after that i looked at two beans and found it. its one coffebean in the bottom left corner, right near the edge of the pic. easy! You shouldn’t have given it away ppl! It surprized me when I found it! I was looking in the wrong place then i looked over a bout and inch and nearly jumped out of my chair! saw it in like 1 second.. its a head peeking through the coffee beans… its in the bottom left but its a bit farther right than the corner. If you consult psychologist about this, at any time, neither of you have a brain. #39 don’t you mean who grows coffee beans the size of a skull? Hey “Perfect Person” #35, if you just HAVE to brag, at least spell “brag” right! Love that illusion! it as the second one I saw when I first found this site. got in a bit less than a minute. man it took me forever to find it but i did right after i blinked after like 4 or 5 days lol. it freaked me out. Hmmmm, very peculiar. Is this really a matter of the brain or of the eyes? Personally I found the face almost instantly (within a glance 1-2 sec.) I cannot help but feel proud of myself, but at the same time very very interested. How is it that so many ppl did not find it as quickly. It was obviously right there. It wasnt even well hidden. It hardly blended in. Could it be levels of colorblindness, contrast, clarity, size of the picture, brightness, or the veiwers screen/monitor. Or am I to beleive I am just one smart cookie? I would feel even more stupid to do that. I saw it in less than a second.”Dan” and “angie” were right. IT IS SIMPLE! Is that for real or is it edited? Someone please answr me! For those of you still scratching your head, don’t feel bad. Are you seeing it at full size (499×343 pixels)? In my browser, it rendered at 400×275. I didn’t spot it after about two minutes at the reduced resolution, but when I opened it in its own window, fully-sized, THEN I spotted it. This also may be because I have a vivid memory of the ‘Waldo’ character, so I wasn’t looking for a human face…I was looking for Waldo’s face! Once I found the face, I felt a little misled: that’s not Waldo! Interesting that having the word ‘Waldo’ in the caption would’ve focused my mind on matching such a specific image. I didn’t even read the text above the picture, I was just looking and not too long into it BAM, there’s a face! I hope that guy got outta there before the grinder fired up. Laura. Last night I looked at this for about 20mins and could not find the face, today I look at it again and there he is. good one I like it. wow when i looked at the shiny bean i got it! g it sure looks well weird! lol!!! Oh, I was looking for a face out of the coffee beans, not just one. Anyway, I see it now, and its cool. like first i looked @ it for 3 mnutes then i reset the page n then i ammediatley sawit n it scared me !!! I agree with falloutgirl, lol … that’s a tad creepy! oooo thats kwl and kinda freaky! “waldo” is a wierd guy! i still think that i am stupid after taking ten minuits to find the head on high resolution! HOLY CRAP!!!! it took me 4eva 2 find it! CREEPY! i had to read thru the comments to find it! IT IS MADE OF 1 BEAN!!!!! that’s just mean…..but i gotta love it! Good one, I first tried to look at the beans to form the face, and than around 10 sec later I just spotted that small face. Nice one. OMG! once u find it its really hard not to look at it! hint bottom left ish middleish! Woah! I was looking for a face in the entire picture, awsome! oh my God! I was looking so long it scared me when I actually found it! He must either be a ‘pin-head’ or else those are some VERY large beans! THANKS UNO. I FOUND HIM. THATS WILD! THOSE ARE SUM HUGE BEANS. he was elusive at first, then i spotted him! boy did he give me a start. the face is actually a human face not a face made out of beans. now try the baked bean one, which i found even harder!!! am i weird if i said i saw a really creepy face in the exact middle of the pic? (almost dead center, looks like a corpse revealing HIS right eye with a busted up nose and an open mouth?) he looks like he’s buried a little under the beans. Holy cow. It scared me when I finally found it. I can’t believe I looked over it for so long. I found the face in the coffe illusion. Did anybody find the face besides me. Let me know by adding your comment. Ok, I feel tricked! I guess I’ve been looking at too many of those 3D illusions where you have to de-focus your eyes to see the big pic. I thought it was going to be a big face made of lots of beans, not one face the size of one bean! What a creepy little man. OK, that freaked me out. i found it strait away! you have to find out what’s wrong with the room. oh. my. gosh. that scared the juh-beanies out of me. I jumped out of my seat when I saw him. EEK!! Scared the crap outta me!! OMG now way, that was awesome!! I SAW IT!!! hahaha …..
F.Y.I. “Einstein”, I actually *was* going to post that hint. So don’t be calling ME stupid! Why, I’d curse you in every language I know (which is a lot) with every curse word I know (also plenty). Too bad it’s the internet. But seriously, DON’T BE POSTING THINGS LIKE “shows how dumb you are” CUZ IF U DONT HAV ANYTHING NICE TO SAY, THEN DONT FRICKIN’ SAY IT!!! It’s really creepy when u finally find it and it just sort of jumps out at you….well, it scared me, anyway. oh my god. i was trying to find a face in the entire picture, using all the coffee beans… after realizing the real challenge, i found the face in a matter of seconds… haha. well, i felt like a complete idiot for a while there. click on it to make it larger and you’ll see it quickly! I’m normally great with illusions but up until now that was one of the few I couldn’t get my head around until i realised that it was the size of a bean and not a face in the beans. WOW THAT REALLY STANDS OUT ONCE YOU FIND IT!!!! I DIDNT KNOW THERE WAS An ACUTAL MAN IN THE PHOTO! Right Ive Found The Man In the Coffee Beans But I Can Also Make Another Face FROM The Coffee Beans! When I first looked at it, I thought it would be a face arranged by the beans, not just the man’s head lol. I thought the face was really hard to find. Until Someone pointed it out 2 me lol! After I read Uno’s comment about the bottom left I got it. Y couldn’t I c that b4? That is just freaky ! i cant belive i did’nt see it ! Nice joke, but I wouldn’t name it an illusion, right? HEZ GOT A BEAN-HEAD!! HA-HA-HAAA!!!!! u monsters, tricking me like this! gee, i couldn’t see it until i read a comment, it nearly made me fall off the chair — creepy. It took me about half a minute to find the head in the beans, but while I was looking for it, I found a shape that looked like a baboon, with the one extra-dark coffee bean making the snout. The face is in the bottom left corner. I can still immediately see the face even though a year past by since the last time I saw this illusion! It took me about a minute to find it but I almost had a heart attack.It scared the crap out of me. The face sure is scary. I was shocked when saw it accidentally. Oh my god, I was looking at it scanning and I screamed so loud because I found the face! OMG… hahah it all happened so fast!!!!! now thats just cool. i saw this illusion ages ago and just couldnt find it ! he is down there next to that bean with the thinggy on it. Did that help? Nah didnt think so ! oh wow, that surprised me once i found it!! made me jump the first time then it was just a friendly man. at the bottom in the middle, kind of. Don’t get too close! pahaha it was frigging hilarious, i was first looking for a big face then i saw it in about 4 secs, my friend took like 10 mins when i showed her she sreamed and ran out the room lol! that is so awesome! thanks for showing me that. At first i couldn’t get , but my bro showed me. but u splet the title wrong..
i found this illusion about 5 months ago and it took me about 15 mins to find it. but today i was just pressing the random illusion button and i saw this again and i just noticed, this was made on april fools day!! ye. its a weird face indeed.. I saw he at the bottom of the picture. Besides that, I saw two figures with one showed eye…..
that sure was easy besides ive seen it before. Start from the left, go a quarter of the way to the right, then almost at the very bottom, there is an actual face looking up at you, not a face made of coffee beans like i was looking for. actually where is d face???? THIS IS WHY YOU SEE FACES IN…BEANS. NOTHING SPOOKY ABOUT IT I PROMISE!! Pareidolia (pronounced /pɛɹaɪˈdoliə/ or /pæraɪˈdəʊliə/), first used in 1994 by Steven Goldstein, describes a psychological phenomenon involving a vague and random stimulus (often an image or sound) being mistakenly perceived as recognizable. Common examples include images of animals or faces in clouds, seeing the man in the moon, and hearing messages on records played in reverse. The word comes from the Greek para- – amiss, faulty, wrong – and eidolon – image, the diminutive of eidos – appearance, form. OHMIGOSH!!!!!!!!!!!!! I was staring at this photo for like the longest time and then I finally saw the face!!! Its not IN the coffee beans, it IS a coffee bean!! Great!!! I found the face!!! Kinda gross, actually. You go to get some coffee one day and you here a tiny voice screaming. “Where is that coming from?” you ask yourself. Well, it’s that bald Coffee bean hobo dude. But you don’t know that, and you acidentaly drink his juice. Yuck. Well, the first face I saw looked like a chubby baby. It’s the one near the bottom right corner. Kind of looked like Chucky if you ask me. Do you really have to say you see something else to feel special? Bealive me. You’re great the way u are, even tought u don`t even see it. I always thought that the man was a pattern in the beans, no just one bean. But I looked at this one day, and then I saw it. this is not an illusion ,this is like the freaky clow vide u see on youtube! Haha, found it like 5 seconds after I opened this. I started at the bottom. The face isn’t in the bean, it’s a bean itself. it scared me when i saw it! u jumped!! lol! that was a bit freaky..
OHHHHHHHHHHhh……….. i always thought that the beans formed a face omg got to fool my friens with this! dude, i found it in like two seconds. i found it ahm…i think 4-5 sec…. trying to find this face..
as soon as i found him i thought he was gonna come out the computer & murder me ! but i got really creeped out . so is there any possibility that there’s a picture containing a trace where the face of the man is? Those are some really, really, big coffee beans!!!! We did it at school and me and my mate Robyn found it within secound. The rest of the class took 15 minutes. By the end, Me and Robyn couldnt gte freaked by it anymore and showed everyone. Anyway, What im trying to say is. Theres an ACTUAL human face in the lover left. You dont make a shape. Uh… I think that is the point. owwwwwwwwww i see it. Look at the darkest bean, you’ll see a semi side profile face of a person. I thought a 3d illusion which is not. Face on a one bean. Its not the darkest bean, for those who absolutely fail to spot the face this image shows you were it is. 4. Psychology . a perception, as of visual stimuli (optical illusion), that represents what is perceived in a way different from the way it is in reality. This isn’t an illusion. It’s a “hidden picture,” like they used to put in Highlights Magazine. That head is just disgusting! it creeped me out when i found his face in the beans ..
Why are the same beans Photoshopped over and over? Now for the laugh of the day. The bald old man in the coffee beans is ME. I made this picture about ten years ago, when I was teaching Photoshop in College. I sent it to my friends as a joke saying I was worth a hill of beans. No medical study was involved. What a hoot to find out you have become an urban legend. Yeah right. Jeez, man, how dumb do we sound? I believe you, Benjamin… I believe you. Oh my god, that’s one creepy little face, saw that within 3 seconds, Nightmares tonight, eh? lol thats so cool! i wish i was in your class! Ok then Benjamin… *pat pat* we all believe you. There wasn’t photoshop ten years ago. whoa I was just about to give up because I thought u meant the coffee beans were making a face altogether but then I saw it and I think im gonna have nightmares!! its kinda funny. you dont realize its even there till somebody points out where its at. Whoa! This image of faces iz kinda scariez! It gave me the hiddabagibeez! This was Awasum! Ha, this took me forever. I, like many others, was trying to make a face shape out of the beans. On a side note, Aiyanna, will you please learn how to use your keyboard correctly? That ridiculous nonsense that you’re trying to pass off as english is not cute, it makes you look like a fool. There appears to be 2 fingers as well. 2 beans seem to be the tips of 2 thumbs. Hi there! I didn’t see the kitty face or the light reflecting the other face. Meow! Creepy! Very Creepy! took me a couple if minutes, though as soon as i stopped trying to look for a hidden design within the beans i found it pretty quick. Neither can I. Could you guys at Mighty Optical Illusions post a version that points out the face? It’s down the bottom near the centre look for a bald head and two eyes. I see what you did there, DANNI. I FOUND THE FACE AND THE FACE OF LIGHT BUT CAN NOT FIND THE KITTY FACE EITHER!!!!!!!!!!!!!! Oops! I meant it took ME like 10 minutes! Not “it took BE 10 minutes”! Lol. this has creeped me out!!! it toke me 5 seconds!! :D it was easier for me than the rose picture -_-…. i think i drank him last morning. Omg… I see the kitty, the man, and the light reflecting off of the dark bean. The kitty and the reflection are very distinct. The kitty is fairly hard to make out, considering how squashed up it’s face looks. If you look into the top left corner, and slowly move your eyes to the right, you will see the hidden kitten. Half of the coffee bean is exposed, showing the kitty. AHHHHH! face scared me so much! BTW, @ Meowkitty123, SWEET KITTY!!! Dude that scared me once I found it!! hockeyplayah, don’t be so cruel to danni. Maybe he/she does actually have learning difficulties. I am ten too and I know what it’s like to be bullied. A lot of people will agree with me here that when you get bullied, it’s not nice. So leave Danni alone, okay? oh my god i was on the verge of quitting then this face popped out at me!! SCARY!! omg but really cool. it took me like 3 hours to find it i thought the face was made out of coffee beens!!!! anyone else see the tiny arm and hand on the left – top half? Yes, I see the arm and hand. If you start at the top left corner, it’s about an inch down and a half inch to the right. OMG!!! was pretty easy, found it in a couple of seconds, and didn’t really freak me out, but i can totally see how it could be different for other people. found real face, and light reflecting of bean, but no kitty face can someone plz tell me where??! simple i found it as soon as the picture came up. I cant find it anywhere…. is there a page with the answer?